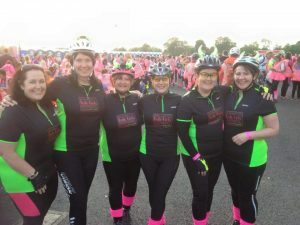 On 28th May 2016 our Finance & Office Manager Kathryn Mitchell, with a team of 6 friends, took part in the Women V Cancer – Ride The Night cycle charity event. The event was a 100km cycle through the night, starting and ending at Royal Windsor Racecourse with a break for tea and cake at Buckingham Palace! The team raised £5,275.00 for the three charities involved in the event: Breast Cancer Care, Ovarian Cancer Action and Jo’s Cervical Cancer Trust. We are all very proud of Kathryn and her teammates and the amount of many raised for charity.